“A holy woman, a true gentle lady whose words were born of God.” So states the only snippet of biographical information about Hadewijch to be passed down from the Middle Ages. In the eyes of her contemporary admirers, her holiness made her writings so valuable that she was the first Dutch literary author whose work was collected in one volume. Medieval manuscripts of her work testify that Hadewijch’s texts were still being read in religious circles in the sixteenth century. The dissemination of individual texts reveals that people particularly appreciated her prose pieces, especially her Letters. When, after centuries in obscurity, two manuscripts of her work were discovered in 1838, there was a resurgence of admiration for Hadewijch. This time, the fervour was not religious but literary in nature. The linguistic virtuosity with which she expressed her passionate mysticism is impressive, especially considering that Dutch as a written language was in its infancy in her time, and certainly not used in religious texts. This mastery is particularly pronounced in her lyric work. 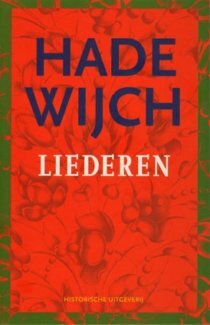 Hadewijch’s songs consist of 45 texts that are inspired in form and content by profane courtly love songs. In the profane song, a knight/lover sings about the lady of whose love he hopes he is worthy. Hadewijch shifts the courtly relationship to a mystical context. The Lady to whom the knight/lover offers his devotion is called Minne (Love). She is the divine love that the lover longs for and with whom he desires to be united by becoming pure love himself. Just as did the court troubadours and minnesingers, Hadewijch takes as her theme the absence of the beloved and the resulting oscillation between hope and despair. It was not only thematically that courtly love songs were a great source of inspiration but formally too. By far the majority of the 45 songs are based on (often complex) rhyme schemes drawn from the northern French chansons. But Hadewijch also turned religious song forms into poems. The collection includes six rondelli, a Latin liturgical song form to which people danced; two hymns; and finally, a poem based on a sung Latin mass for the Virgin Mary. Hadewijch did not only want her songs to sing the praises of divine Love and give a voice to the hope and despair of the loving soul: she also wanted to educate and encourage her audience, which undoubtedly consisted of kindred spirits who, like her, aspired to spiritual perfection. To do so, she completely mastered the art of the profane chanson. She did this, for example, by subtly embellishing classic courtly love motifs with biblical references. To the voice of the protagonist, she added an omniscient voice that repeatedly nudged and encouraged the audience to behave in a way that suited their mystical mission. She also had a third person character – an exemplary knight/lover – with whom the audience could identify and from whom they could learn that loyalty, courage and surrender are the best weapons if the adventure of love is to have a happy ending. Hadewijch employed memorable words to describe love’s adventures. She called the pleasure of oneness gebruken (fruition), the pain of missing someone gebreken (falling short), the unbearableness of longing orewoet (impetuosity). These are words that continue to appeal and which have inspired many since Hadewijch to produce new work.